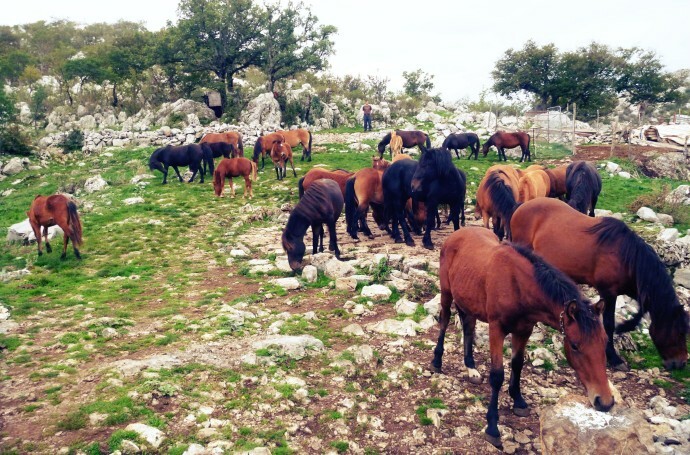 Five more horses of the ancient and endangered Bosnian mountain horse breed have now been added to the already existing herd of wild-living horses in the Velebit Mountains, Croatia. On the warm and sunny last day of September, a white transport truck was slowly climbing up a road in the western slopes of the Velebit Mountain chain, and with great efforts reached it’s final destination: Petar Knezevic’s farmstead. Its long-awaited special cargo of Bosnian mountain horses was carefully delivered from Gorski Kotar in Croatia, accompanied by Ms. Ester Linnartz-Nieuwdorp, a Dutch horse rewilding expert who looked after them during each stop along their way to their new home. The horses’ former owners, Mr. Anton Dolinšek, also owner of the Ergela Planido from Slovenia and his partner Mr. Damir Voloder, owner of the Ergela of Bosnian mountain horses „Gorski Kotar“ in Croatia were also present. Natural grazing by large herbivores is a key process for natural maintenance of ecosystems. Natural grazing maintains the ‘mosaic landscape’ of rich, open fields, shrubs, thickets and old growth forests and is therefore crucial for the biodiversity. In wild nature the animals graze and browse all year round. A viable wild-living horse population is good for nature and for people and business, as well. The rewilded horses will provide the local people with new job opportunities, in order to assist the growing tourist flow. New wilderness and wildlife tourism opportunities are developing over time. One adult stallion, three mares and a youngster stallion, all in perfect condition, trotted out of the truck, proudly following one other and were brought to the corral to recover a bit from the bumpy ride. “I am happy to mention that this small herd doesn’t know what a stable is, given that they have never in their life entered one and hopefully never will either”, says the horses’ former owner, Mr. Anton Dolinšek. 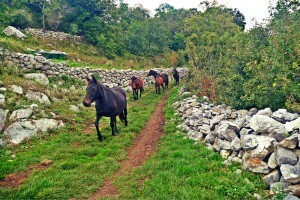 After the horses spent two nights in the corral, together with the members of the existing horse herd, Ester and Peter released them to the mountain pastures. These wild-living Bosnian horses were brought to the rewilding area here in connection with Rewilding Europe’s new report “Rewilding horses in Europe”. The idea is to reinforce the existing herd of wild-living horses in the area and strengthen the process of natural grazing by large herbivores as a key ecological process here. Over the past year, an exceptional situation with wolves arose around Malo Libinje and caused the loss of several of the local wild horses. The efforts now invested are to create a stronger social herd with stronger, tougher leading animals that we hope are able to better protect their herd and be more resistant to wolf attacks then they have been, especially with the added protection value from a sizeable herd of tough Boskarin cattle here, soon to become a Tauros herd. The Bosnian mountain horse is a close descendant from the wild south-Russian steppe horse, the Tarpan (of which the last individual died in the 1880s) and the wild Russian-Mongolian steppe horse, the Przewalskis horse, which has survived into our times, albeit just barely. The mountain horses evolved over centuries in the Balkan region, living a wild life in a natural environment and thereby exposed to all the upsides and downsides of that and living only from what nature could provide. Therefore, it is today still very durable, tenacious, and adaptable to different climatic conditions and regions. It is very fertile, mates without any help, doesn’t need so much nutrition, is of strong health and has an iron constitution given that it is a child of a merciless natural selection throughout the millennia. The Bosnian mountain horse is also considered an endangered breed, with only about 200 individuals remaining and the Rewilding Europe programme here in Velebit also contributes to preserve this authentic breed. The mountain horses evolved over centuries in the Balkan region. On the Thursday morning the horses were released into these mountain grasslands, and right away joined the existing herd. The new group started grazing the lush green grass immediately. The stallion from the old group did some attempts to herd the new group into his, but the mares didn’t agree. The new group remained in the valley all day, accompanied by the Boskarin cows, whilst the old group of horses disappeared from view somewhere in the hill side, were they would graze all day, protected from the strong Bura wind that was blowing strong. The arrival of the new wild-living horses is a good step forward, both towards the rewilding of Velebit as well as towards the rewilding of the horse in Europe, since these carry very important genetic resources and a powerful reinforcement of the existing nene pool. This is all in line with Rewilding Europe’s goal to help bring back the wild horse, a true keystone species for wild nature in Europe’s many different ecosystems. In the areas where this has been tried, the biodiversity immediately increases greatly and the bush overgrowth is being halted, now in the natural, ancient, pre-mankind way. Rewilding Europe wants to restore key processes, that are either missing or are not allowed to function naturally, like in parts of Velebit. Rewilding Europe sees natural grazing of large wild herbivores as one of the key ecological factors for naturally open and half-open landscapes, upon which a large part of Europe’s biodiversity is dependent. We are working to allow our native herbivores to return again in significant, more natural numbers to the lands where they once belonged and where they can again play their ecological role.